CeFaan Kim reports on the arrest in the deadly package explosion. EAST FLATBUSH, Brooklyn (WABC) -- Police on Wednesday arrested a Brooklyn man they believe is behind a deadly package explosion that killed a 73-year-old man in Queens last year. Authorities reportedly searched an East Flatbush location before arresting 37-year-old Victor Kingsley. Authorities say the arrest was the result of a seven-month investigation by the NYPD, FBI and other agencies into the explosion. George Wray, of Springfield Gardens, sustained severe burns when he opened the mysterious package on August 1, 2017. It was the shape of an oatmeal container that had been on his doorstep for several days. Wray died at Nassau University Medical Center days later. NYPD Chief of Detectives Robert Boyce said it is believed the intended target was an NYPD officer who Kingsley incorrectly believed lived in the house. Authorities said it was retaliatory in nature after the officer had previously arrested Kingsley. He allegedly built the explosive device as part of his broader effort to retaliate violently against several police officers who were part of an NYPD unit that had arrested him in January 2014. Sources tell Eyewitness News two explosive devices were found inside Kingsley's home, along with a pipe bomb and a number of precursors and materials to make bombs. Despite the case against him having eventually been dismissed, federal prosecutors said Kingsley methodically sought revenge against the officers. He conducted internet searches and made telephone calls to determine the locations of the officers' residences. He also accumulated explosive device components via online purchases made through Amazon, which he had delivered to his house in Brooklyn, the complaint said. Ultimately, he allegedly arranged for the explosive device to be placed outside of the Queens residence. The building owner inadvertently detonated the device when he tried to open it. Kingsley is charged with using a weapon of mass destruction. If convicted, he could face a maximum sentence of life in prison. 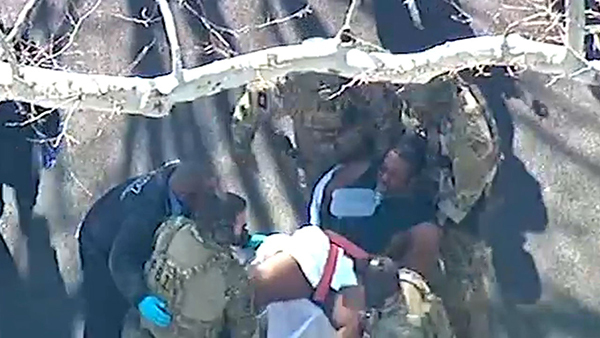 NewsCopter 7 was over the scene as he was taken into custody. Court records show authorities believe Kingsley was working on another device. The case against him for the stun gun was dismissed. He was taken to the hospital for a psych exam. Neighbors say they never realized Kingsley lived in the home with his mother. They say she was friendly and sweet. They say he would never say hello. "She would sweep on her own, she would shovel the garden, I mean shovel the front of her house by herself," said Louis Joseph "So we always wondered why, we knew he had a son but he wouldn't necessarily help."